Just hours after Apple had introduced its new Swift programming language, developer Nate Murray was showing how easy it was to use Swift by creating a short demo app. That example program was (what else?) a Flappy Bird clone called FlappySwift. Swift is currently an alternative to developing with Objective-C, the standard language for iOS and OS X development. 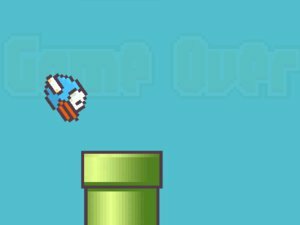 Over on Hacker News, developer Nate Murray said he ported FlappySwift from an Objective-C version of Flappy Bird written by Matthias Gall. Murray said he was able to go from knowing nothing about Swift to a working game port in about four hours. Just as an Epic Games artist recently did with the Unreal 4 Gaming Engine, so Murray did with Swift. Flappy Bird isn't just a game anymore, it's becoming the new "Hello, world"—at least for game development. If you've never heard of it, 'Hello, world' is a simple program designed to print out the words "hello" and "world" on a computer screen. While not particularly useful, writing a 'Hello, world' program is typically the first exercise developers go through when learning a new programming language. Similarly, Flappy Bird has now been used twice to show how easy it is to create apps with a particular programming language or tool. Calling Flappy Bird the new 'Hello, world' might be a little over the top, though. As Lifehacker Australia writer Angus Kidman pointed out,"['Hello, world'] exists to provide a very simple demonstration of how a given language works. It has one function and no interface." FlappySwift, by comparison, still requires hundreds of lines of codes. But the advantage of FlappySwift is that it's an actual game that Swift newbies can comb through to get a better understanding of how to produce an app. It's not a true 'Hello, world' app in the strictest sense, but for anyone looking to program in Swift it's a whole lot more useful. If you're a budding Swift developer, the code for FlappySwift is available on GitHub. Murray said he created FlappySwift not just for the fun of it, but also to publicize an upcoming online Swift game development course on FullStack.io--a site founded by Murray and fellow developer Ari Lerner. This story, "Hello, world: Developer creates Apple Swift-based Flappy Bird clone in four hours" was originally published by TechHive.